ACT Bull Terrier Club Inc. The Australian Capital Territory Bull Terrier Club was formed on a cold winters night in June 1990. Twenty five hardy Bull Terrier enthusiasts from the region gathered to discuss the feasibility of forming a local Bull Terrier Club. After much debate the club was formed adopting the colours of Black and White. Mike Cross was elected as President with Mike Plane as Vice President, Sandy Burns as Secretary and Steve Gibson as Treasurer. Unfortunately both the Secretary and Treasurer resigned shortly afterwards and Di Cross took over as Secretary and Terry McDonnell as Treasurer. The Club has continued with a small group of people dedicated to enhancing the profile of the breed in the area and protecting the breed itself. The Club holds one or two Championships shows each year as well as attending other events to promote the breed. 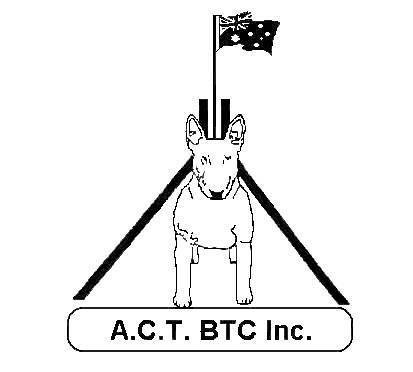 The ACT Bull Terrier Club Inc. is a member of the National Bull Terrier Council (Australia). Membership to the Club is open to anyone who has an interest in the breed. A newsletter is sent out every two months and the membership form can be found on this website.